We welcome you to experience our personalized admission process firsthand. Learn all about how Bosque School challenges each student through a unique approach to education. Founded in 1994, Bosque School is an independent Albuquerque school serving grades 6-12, and dedicated to challenging traditional education. At Bosque School, we design learning experiences that inspire students to explore challenging concepts and ideas and to be daring in their pursuit of deep understanding. At the heart of Bosque School lies the belief that the exchange of knowledge, ideas, and values through community engagement programs is important. The Bosque community atmosphere challenges students to be impassioned and enthusiastic participants and leaders. Students are encouraged to step outside of their comfort zone, take risks and be a part of something new or different. Stepping on the field, court, track or pool as a Bosque Bobcat means being committed to character building, physical health, and good sportsmanship. The Development Office and Administration is dedicated to supporting this mission by nurturing lifelong relationships with our alumni and families, securing financial resources through the Bosque School Annual Fund, the Capital Campaign, and Challenging Champions to make our school the best experience for all students. Senior Thesis and Colloquium is the culmination of a seven-year journey. Each Bosque senior undertakes a year-long independent research project and delivers his or her findings in a twenty-page research essay as well as in the public presentation at Colloquium. In the weeks leading up to Colloquium on May 15 and 16, the BUZZ will feature the thesis topics of Bosque’s seniors and provide insight into student researchers as they work toward the completion and presentation of their finished work. Mark your calendars for Senior Colloquium! 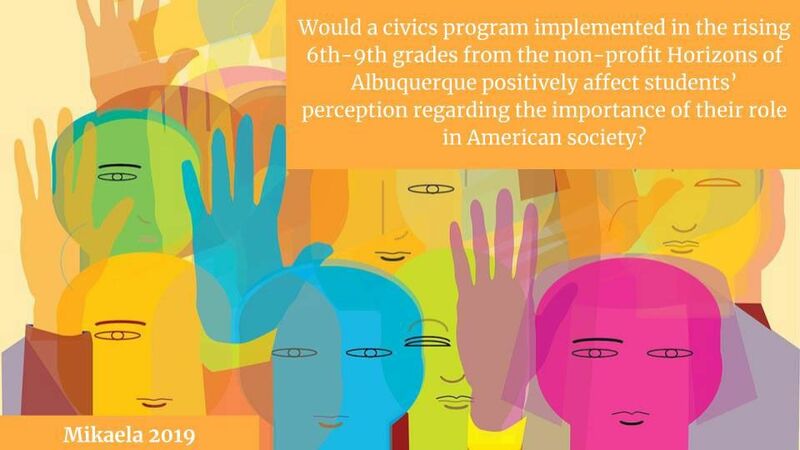 Would a civics program implemented in the rising 6th–9th grades from the nonprofit Horizons of Albuquerque positively affect students’ perception regarding the importance of their role in American society? How does civics education affect youth in regards to their understanding of the importance of their voice and actions within a community? How is this effect magnified for at-risk youth? How would a civics program directly affect the rising 6th–9th grade students of Horizons of Albuquerque? Mikaela is researching the effects of civics education on youth, specifically at-risk youth, and how a civics education program can benefit and be implemented in the local nonprofit Horizons Albuquerque. She’s discovered that civic education leads to more youth civic engagement, which affects well-being, confidence, and the development of critical life and professional skills; these gains are greater and more profound for the at-risk youth population. Civics education is severely lacking in the general education of youth, and it is a gap that needs to be addressed. Mikaela is a leader for Bosque’s Model United Nations team and served as a witness in the first Bosque Mock Trial team to qualify for the state tournament. She has run varsity cross country for the past four years, and has a black belt in Shotokan Karate. Mikaela has worked with the Horizons Albuquerque nonprofit for the past four years; her work with the organization will continue this summer. Due to her research for the Senior Thesis project, she has been asked to design and implement a civics education program for 7th–9th grade students for this upcoming summer, as well as for subsequent summers. Mikaela will attend Northeastern University in the fall, majoring in International Affairs and Economics with a minor in Public Policy and Law.